Tasha was born in San Francisco but grew up across the country in rural Vermont. She studied cultural anthropology and studio art at The University of Vermont and was trained to teach English as a second language at Masaryk University in the Czech Republic. She has worked as an art instructor, college advisor, and English teacher in Vermont, Maine, California and just returned from a year abroad in Cyprus. Tasha loves working with teens and being a part of a strong and confident transition from youth to emerging adulthood. 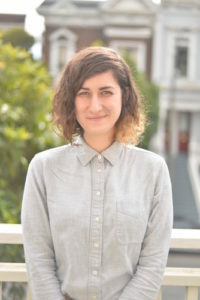 Tasha currently oversees internships with the: San Francisco Public Utilities Commission, Department of Public Works, Department of Building Inspection, City Planning, Municipal Transportation Agency, Port of San Francisco, and SFO.